In 2016 the Center for Popular Democracy’s Fed Up campaign published “To Represent the Public: The Federal Reserve’s Continued Failure to Represent the American People.” The report uncovered a shocking lack of gender, racial, and occupational diversity among the Presidents and Boards of Directors at the twelve Federal Reserve Regional Banks. 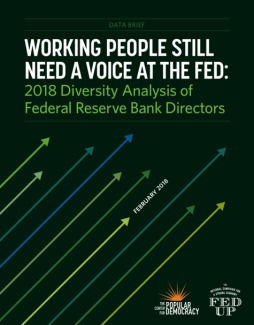 This brief analyzes the gender, racial, and occupational diversity of the 2018 appointees to the twelve Federal Reserve Regional Bank Boards of Directors. The analysis finds that while the Federal Reserve has made modest progress in gender and racial diversity, Fed directors from business and banking continue to dominate leadership positions and fail to represent the interests of labor and consumers. In 2018, policymakers and advocates are calling on the Fed’s new chair, Jay Powell, to build on this progress and continue ensuring greater diversity at all levels of the Federal Reserve’s leadership.